June 23, 2017 - Sportstalk radio as we know it began on July 1, 1987, when Suzyn Waldman, now the radio analyst of the New York Yankees, gave the first sports update for 24-hour sports station WFAN Radio. The station celebrated its 30th anniversary on June 22nd with a special live broadcast from Grand Central Terminal's Vanderbilt Hall. Many past and present WFAN radio personalities as well as high profile New York athletes, owners and executives dropped by throughout the day to celebrate 30 years of sports talk memories. "Boomer and Carton" kicked off the day's festivities with their morning 6-10 am show. They reminisced about their 10 years together and welcomed special guests Joel Hollander, the former head of WFAN who was responsible for bringing Boomer Esiason to morning radio at the FAN, as well as Russ Salzberg, who hosted a show on the station with Steve Somers and was also the longtime sports anchor at New York's WWOR-TV. Next up was "Benigno and Roberts," the FAN's mid-day show hosts. Ann Liguori, who was there from the beginning as the first woman to host a sports call-in show, joined Joe and Evan to reflect on some of her memorable moments at the FAN. The Lifetime ASA Member recalled the time Bill Parcells called into her show right after he had left the New York Giants. When Ann asked him about his plans for the future, he hung up on her. But the two-time Super Bowl-winning coach wasn't finished. "He called me in the newsroom and started to yell at me," Ann recalled. "I guess it was a touchy subject for him. He could've just said, 'no comment.'" Liguori was also able to secure interviews with the Yankee Clipper Joe DiMaggio and NFL Hall of Famer Jim Brown, who also became upset with Ann when one of her callers brought up the time he allegedly threw a woman off his second floor balcony. Brown later explained the woman never pressed charges. Veteran talk show host Mike Francesa, who has been with the station since its inception, closed out the day with his afternoon drive 1-6pm show. 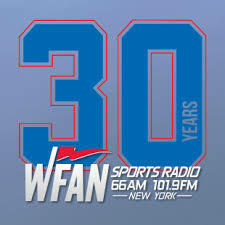 Francesa, who is also celebrating 30 years with the FAN, will be leaving his post in December. Francesa had a who's who of New York sports celebrities stop by, including Yankees legend Bernie Williams and Yankees and Mets superstar Darryl Strawberry. The two sluggers talked about their most memorable moments in the post season, including Strawberry's big home run off Nolan Ryan in the 1986 NLCS against the Houston Astros. "In 30 years of the FAN, these guys gave us plenty of thrills," Francesa said. Also stopping by was longtime ESPN and New York Knicks play-by-play man Mike Breen, who was the sports anchor on the "Imus in the Morning" show for 14 years. Breen just finished up his 12th NBA Finals and his 25th year as the voice of the New York Knicks. Breen recalled he was working at WNBC at the time WFAN came on the air, and he and his colleagues gathered around the radio to listen to the new station. "We laughed and said this 24-hour station will never last. Before you knew it, we went out of business two years later." Ian Eagle, ASA Advisory Board Member and one of the top play-by-play men in the business who got his start in broadcasting as the Board Operator on the "Mike & the Mad Dog" show in 1992, called into the show to reminisce about his humble beginnings. "I was a true product of WFAN," Eagle said. "I had no professional experience when I took the job. I was an intern, a board operator, producer, reporter, pre-game host, talk show host, sometime psychiatrist and a play-by-play guy. All of those roles I pulled off during my time at WFAN. I have incredible memories and this is really a joyous occasion." "The Bird," as he was affectionately called in those days, now serves as the voice of the Brooklyn Nets and calls the NFL, college basketball and other assignments for CBS Sports. Of course, it was the legion of sports craved fans and callers that really kept the station afloat for all these years and made it the powerhouse that it is today. "If you don't have loyal passionate listeners then none of this works," said Francesa as he closed the show. "I have been very thankful for having an audience that has been there for me for 30 years, which is more than anybody could ever hope for. And the station as a whole has been inordinately successful and created a new format on the AM dial. There are over 1,200 sports talk radio stations in America now. This was the first and it will always be the best. If we changed the way sports was done in this country, it was because there was an audience for it and fans were receptive to it, because without ratings none of it works. “So to all of the fans and to all of those who were part of the station over the years, we say thank you,” concluded Francesa.